ALPERN AT LARGE - New Mayor Eric Garcetti has inherited both a legacy and a huge "to-do" list from former Mayor Antonio Villaraigosa, and it's no secret that both men share the desire to establish a first-rate 21st Century transportation system for the City and County of Los Angeles. However, Mayor Garcetti has the opportunity and need to build upon the successes of his predecessor, while reversing some of the inertia and baggage his predecessor left him as well. And it's safe to say that Angelenos and LA County residents expect no less of Mayor Garcetti, because he resides in a county and Southland that many (perhaps most?) 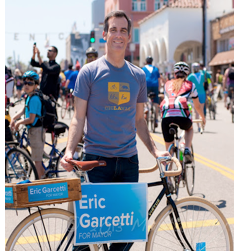 non-Angeleno residents know more of and about Eric Garcetti than they do of their own smaller-town mayor. It may seem crazy, but it's true that when it comes to major transportation and other initiatives, Eric Garcetti is de facto mayor of more than just Los Angeles. So let's do a quick overview of some of Antonio Villaraigosa's accomplishments, which were HUGE: he broke through the legal and funding roadblocks to reconstructing the Wilshire Subway, helped pushed through Measure R and almost pushed through Measure J, helped start the America Fast Forward initiative in Washington, and did yeoman's work behind the scenes towards getting light rail built from the Expo Line through Crenshaw Blvd. to LAX. Villaraigosa's baggage includes: too much wining and dining and inappropriate promises with developers who cared not about transit, the environment and mobility but with making only a quick buck, turning off Angeleno voters by bad land use and budgetary decisions after they voted overwhelmingly for Measure R, and creating a city/county divide that unnecessarily alienated and infuriated the San Gabriel Valley, Southeast County Cities and South Bay Cities. It's not accurate or fair to say that Villaraigosa's negatives outnumbered his positives on transportation--much of it he couldn't avoid, and involved tough and painful decisions, but the style and nature of Eric Garcetti gives the latter a golden opportunity for a fresh start--but Garcetti WILL be expected to keep up the efforts and energy of his predecessor on transportation, lest he be viewed as another Mayor Hahn. GOAL #1: Pick the right three Metro Boardmembers to represent the City of Los Angeles! This is a chore I do not envy Hizzoner Garcetti. Everyone has an agenda, and no one wants to be disincluded. Effectively, he'll have four votes on the Metro Board, and while has been argued that we should have voters directly vote for the Metro Board, it's not the way it works. So in other words, fellow voters, your City and County votes mean something with respect to Metro decisions! We've got an Expo Line that's not finished but has much if not most of the big hurdles behind it, we've got a Crenshaw Line that remains controversial and divisive within the region and City, a Downtown Light Rail Connector that is not without controversy, and the need to finally connect MetroRail to LAX. So Garcetti will need loyal advisors and friends to form a reliable and savvy voting bloc on the Board. My recommendations (and boy, won't Garcetti get oodles of "advice") is to keep Richard Katz (a smart, savvy veteran) and to appoint Westsider Mike Bonin and Mid-City/Downtowner Jan Perry. GOAL #2: Create betterments for the Expo and Crenshaw Lines that include Regional Transit Centers! The key stations that will have two connecting rail lines will become reality within a Garcetti mayoral era (especially if he is re-elected in four years) include Exposition/Crenshaw, Exposition/Sepulveda/Pico and Century/Aviation. These are perfect locations for rail, bus, DASH van and other options for intermodal transit centers and transit malls. Land use decisions are critical at these sites, and after the Casden debacle at Exposition/Sepulveda/Pico (Casden never gave a damn about transit-oriented development, and now isn't obligated to build one), the need for Metro and the City of LA to step up and make these transit centers to serve commuters is more glaring than ever. And while we're at it, parking for all key stations where it is in short supply is necessary to encourage Angelenos who choose to get out of their cars to do just that. Parking does NOT discourage transit use, and anyone in Planning or the LADOT who continues to drink that kool-aid should be fired or transferred post-haste. GOAL#3: Be the right communicator and diplomat to get past the contentious Crenshaw/LAX Line conundrum! Antonio Villaraigosa and Mark Ridley-Thomas helped get us past most of the nasty and thorny decision-making and politically-sensitive issues with their recent decision to award the project to a contractor that will build what is one of the most expensive light rail projects ever, and with both an underground Leimert Park and surface-level Westchester/Hindry station...but without a Park Mesa tunnel. The Westside and South Bay potentially had their projects in jeopardy because of the over $120 million devoted to this Crenshaw/LAX Line betterment, which set one region against another until Measure C money could be found to fill in their gaps and prevent yet a new crisis. The fury of the Mid-City of the decision to keep the Park Mesa region surface-level is both palpable and understandable , but it should be reminded that legal precedent and Metro policy prevents such a tunnel. Ask South Pasadena and Cheviot Hills residents what happened to their desired tunnels, and it's not hard to figure out that if Metro policy (based on car trips and safety measures) prevents a tunnel at one location for a given project, then it does so for all other comparable locations and projects. It's the law, and any contractor who promises the moon (or a Park Mesa tunnel) is doing so inappropriately and without any legal merit. Better to focus on a new Measure J and long-term plan that focuses on where a tunnel MUST be placed, which would be to expand this Crenshaw/LAX line north underground (required for legal and engineering reasons) to the future Wilshire Subway, and which would make this light rail a very well-ridden line, indeed. Compromise is tough, gut-wrenching and downright painful. Let's focus on how to spruce up the Crenshaw Corridor and help the merchants there any way we legally can--Garcetti needs to communicate these sentiments to a region that is as seething and unhappy as are Westsiders who wanted an Expo Line tunnel in their neighborhood. GOAL #4: End the East/West divide with respect to the Foothill Gold Line! While County Supervisor Mike Antonovich gets failing marks for political acumen, his vision is superb--Metrolink and high-speed rail between the county and the rest of the state (and with Las Vegas), as well as a Norwalk MetroRail/Metrolink connection, to say nothing of the Foothill Gold Line extension to Ontario Airport. The Wilshire Subway is fundamental to the region, but should never, EVER be built to the exclusion of (and paid for by) the rest of the county's transportation needs. If Eric Garcetti wants to tax Angelenos only to expedite the Subway, that's his prerogative, but there can never be a happy county unless he respects the league of allied Republican and Democratic electeds who are backing the Foothill Gold Line extension. If not for Antonovich, do it for THESE folks who need our alliance, not our opposition. In other words, Mayor Garcetti, be the man who got MetroRail to BOTH Ontario and LAX airports! GOAL #5: Get MetroRail to LAX (specifically the central airline terminals)! Despite the aforementioned controversy of the Crenshaw/LAX project, while this project does create a nice network to connect the Expo Line to the Green Line, it does NOT get MetroRail to the central airline terminals...only to Century/Aviation station, which is a mile from those airline terminals. Anger and frustration still beset taxpayers and voters as to why we've not done this yet, but the big problem is the MAP. The freeway and rail right of way are a mile or more from the airport. 1) Create a connecting People Mover Monorail from Century/Aviation to the central airline terminals, to the cost of about $1-2 billion. 2) Redo the Crenshaw/LAX southern portion and create a singular Crenshaw/Green Line under LAX, also to the cost of about $1-2 billion. Only when we have a truly comprehensive LAX/MetroRail plan to serve the Westside, South Bay, Mid-City, Southeast City and Downtown regions will voters and taxpayers be happy. Expansions of the Green Line to the Westside and South Bay must be taken seriously in any LAX land use plan, and the need to revisit Alternative 2 for LAX modernization (NOT expansion) is imperative. Clearly, Eric Garcetti has his work cut out for him...but it can be done. His predecessor has laid the groundwork and cleared many horrific obstacles for him, and now it's up to Eric Garcetti to diplomatically make his visions and case clear to both the electeds and voters alike. The Villaraigosa Era of transportation is over, and the Garcetti Era of transportation must now begin post-haste.